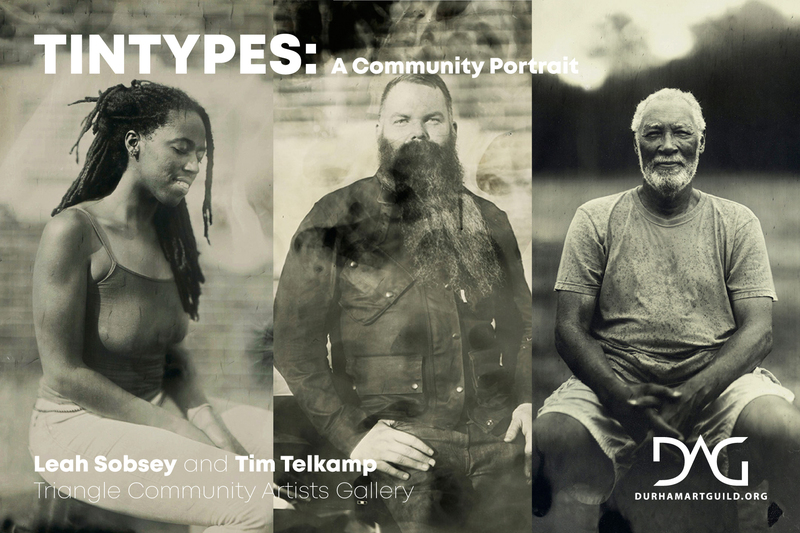 The Durham Art Guild and the Triangle Community Foundation present “Tintypes: A Community Portrait,” the first showcase of the 2018-2019 Triangle Community Artists Gallery exhibition season. This exhibition is a collaborative project by artists Leah Sobsey and Tim Telkamp. Join us for a public reception at the Foundation on Tuesday, October 16 from 5-7pm. This exhibition is on view at the Triangle Community Foundation August 10, 2018 – February 4, 2019. Leah Sobsey and Tim Telkamp were the recipients of the first Click! Photography Festival PIC Grant. The goal of the project, Tintypes: A Community Portrait was to engage with the community and bring people together through the wet plate collodion photography process. The idea was similar to that of the bookmobile or the ice cream truck where people come out of their houses and on to the street to engage with each other and in the process, create a large community portrait. The project had them taking their mobile tintype unit out into the community, setting up across the Triangle in downtown Durham, in Habitat for Humanity worksites and neighborhoods, and finally at a residential/warehouse/art- studio located in Raleigh. Hoping to include a few participants from each location, instead what happened was an overwhelming interest from the community. Their sessions were filled by noon with some electing to wait in line for hours to get a tintype made. In the end, they made over 80 tintype portraits and in the spirit of a true collaboration, families, friends, couples, and individuals came out to participate in the mobile tintype project. Sitters decided how they wanted to pose while collaborating with the artists to create their own unique portrait. In the true spirit of community, this project aims to bring people together through and bridge art and community in a collaborative process. Tintypes are created using the wet plate collodion process which dates from the mid-1850s and was in widespread use through the 1870s. To make a collodion photograph, collodion is applied to a plate just before use. The photograph is captured, developed, and rinsed before the plate is allowed to dry. The process takes roughly 15 minutes from start to finish, while the photographer goes into the mobile dark-room, pours the emulsion and processes the plate. Wet Plate Collodion process is the antithesis of what 21st-century photography has become. We live in an era where portraits are stored in phones, and in digital files. The wet plate process is a very slow process relative to the point, click, and post online era in which we live. Our hope is to bring the portrait back to life through the object based tintype and to encourage dialog about art and community.